Yesterday was the one year anniversary of mydinnertoday. Yes, it’s been a year already and there’s 205 posts to prove it. If you’re curious about stats, the number of views on a monthly basis has grown six times since last November to approximately 1500 views per month, 12,ooo views in the first year. How to make: Heat the oil with the butter at medium-low heat. Add the onions, salt, and thyme. Cover the pan/pot and cook for about 10 minutes, stirring from time to time. Then, increase the heat to medium-high, uncover and cook for another 20-25 minutes stirring frequently. When the onions have browned add the stock (preferably hot), add more salt and pepper if needed and the wine and cook at low heat for another 10 minutes. Now, for the “gratinee” part: for 6 crocks, bake 6-1o slices of bread. Arrange them on a shallow pan and bake in a pre-heated hot oven (400F/200C) for about 10 minutes. Place a slice of bread at the bottom of each crock. If the slices are two small and you can fit two, do so. Ladle a cup or so of soup into the crocks, leaving some room on the top for the cheese. 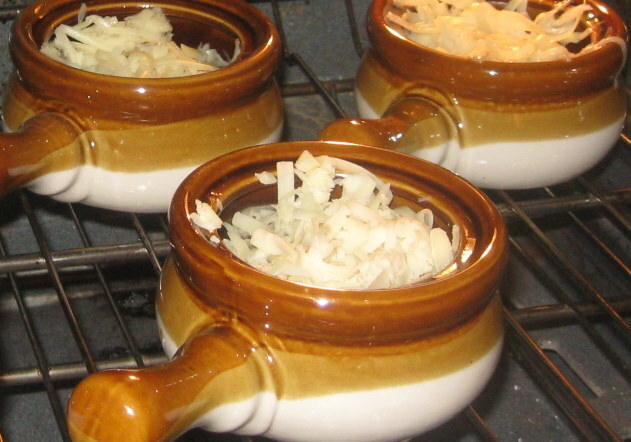 Top with two tablespoons of grated Gruyere cheese and cook in the oven for about 30-40 minutes or until the cheese is nicely cooked and slightly browned. Serve with extra care as the crocks are really hot and so is the soup under the cheese!!! I trained my kids to handle the crocks before serving. 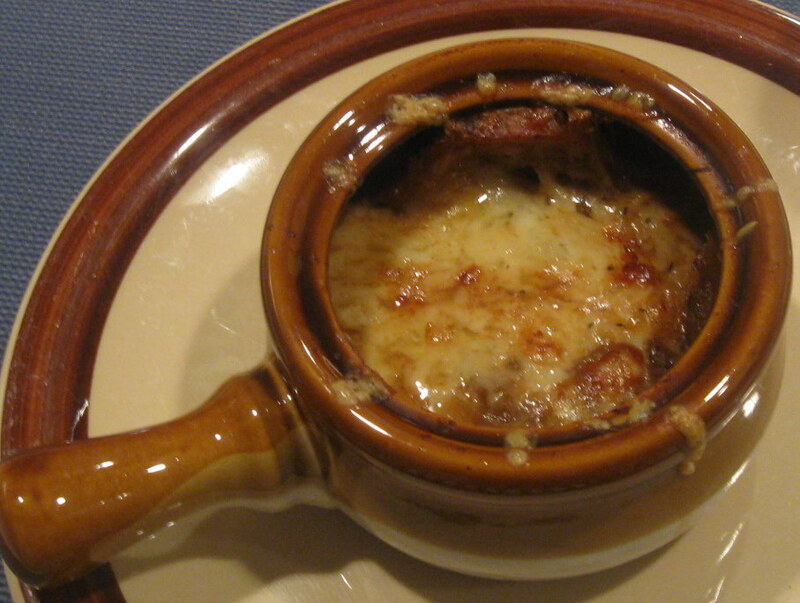 Notes and tips: You don’t have to make the soup ‘gratinee’, if you don’t have time but have onions and broth go ahead and make a meal. Even without the cheese on top, the soup has a strong and very rewarding taste. One important thing to note is the broth. The quality of it is kind of crucial. Homemade is best, of course. I have tried many broths from the store and they all differ a lot in how they taste. I have been pleased with beef broth more often than chicken broth. The one I used was from Trader Joe’s, which was OK but not comparable to homemade. Congratulations on your one year blog-anniversary! Your soup looks great! Thanks, Magda. How old is yours? Mine will be one in a couple of weeks! I will be posting the recipe for the birthday cake soon!